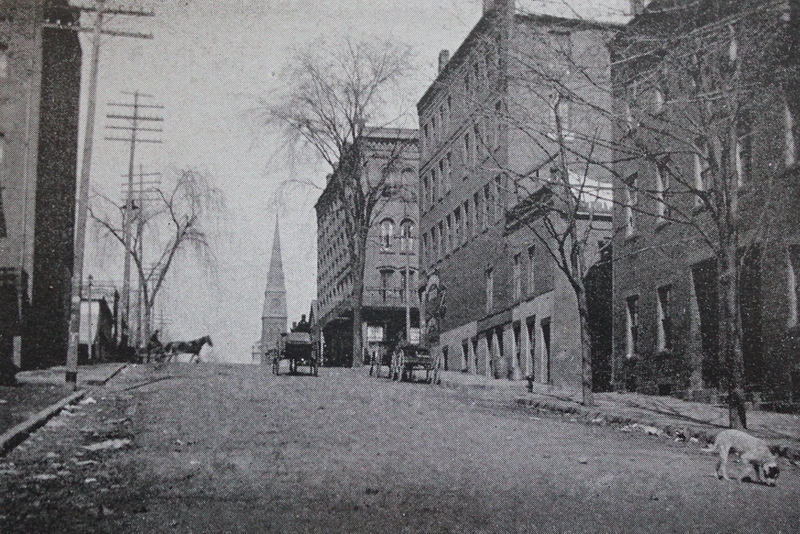 Looking northwest up Hampden Street, toward High Street in Holyoke, around 1892. Image from Picturesque Hampden (1892). These two photos show Hampden Street, just down the hill from where the photos in the previous post were taken. 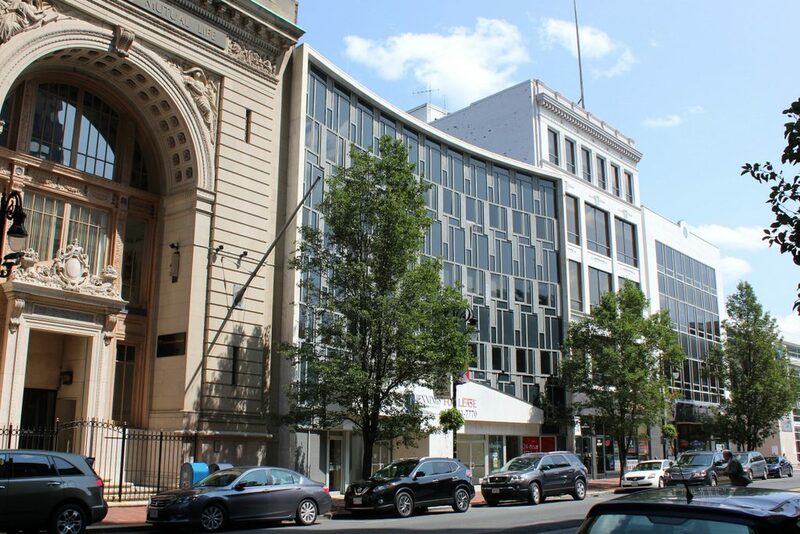 However, while the other post shows the view looking straight down the street, this view provides a better look at the buildings on the north side of Hampden Street. On the far right side of the first photo is one of the many tenement houses that were built in this area for the workers of the Lyman Mills. 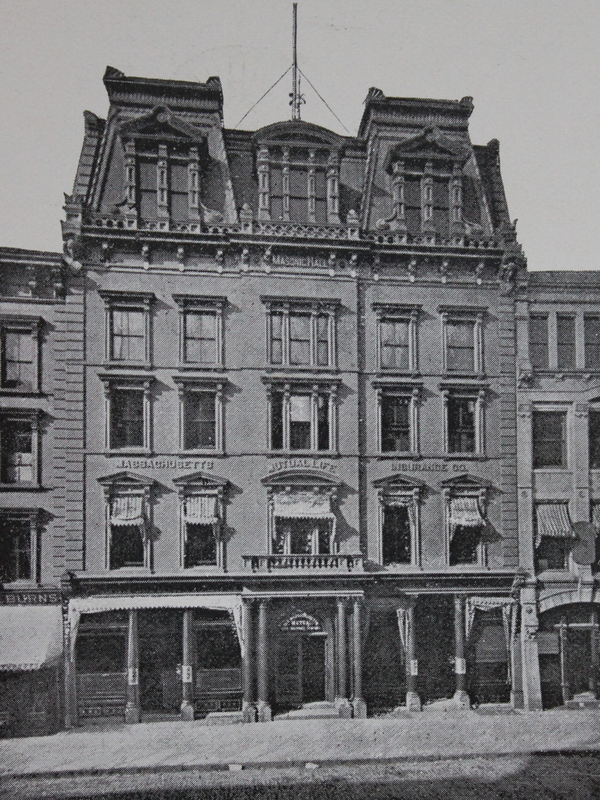 Just to the left of it, the building at the corner of High Street was built around the early 1860s by W. L. Martin, a coal, wood, and flour dealer who had his store here in the building. 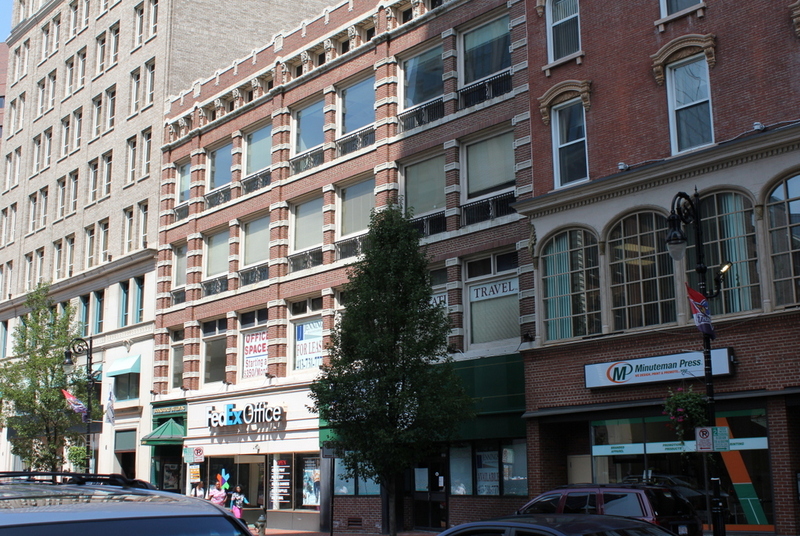 On the other side of High Street is a similar four-story brick commercial block, probably dating to the 1860s or early 1870s, and further in the distance is the tower of St. Jerome’s Church, located at the corner of Chestnut Street. The first photo also shows some of the traffic on the streets, with several horse-drawn carriages near the top of the hill and a stray dog in the foreground on the right. Today, about 125 years later, this scene is still recognizable from the first photo, although several of the buildings are gone. 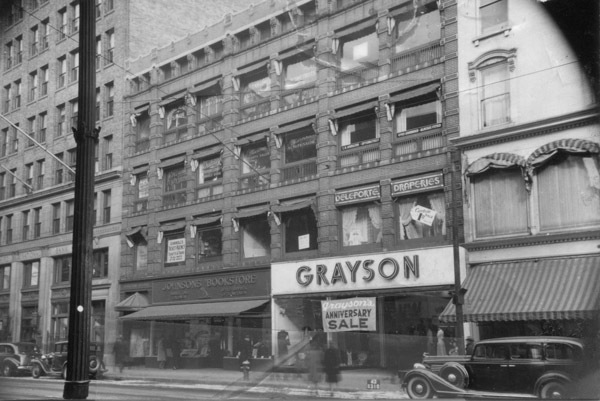 The building on the right, along with the rest of the Lyman Mills tenements, was demolished in the late 1930s as part of an early urban renewal project. The bricks were saved, though, and were incorporated into the apartments that now occupy the site. The building on the other side of High Street is also gone, and the site is now a surface parking lot. 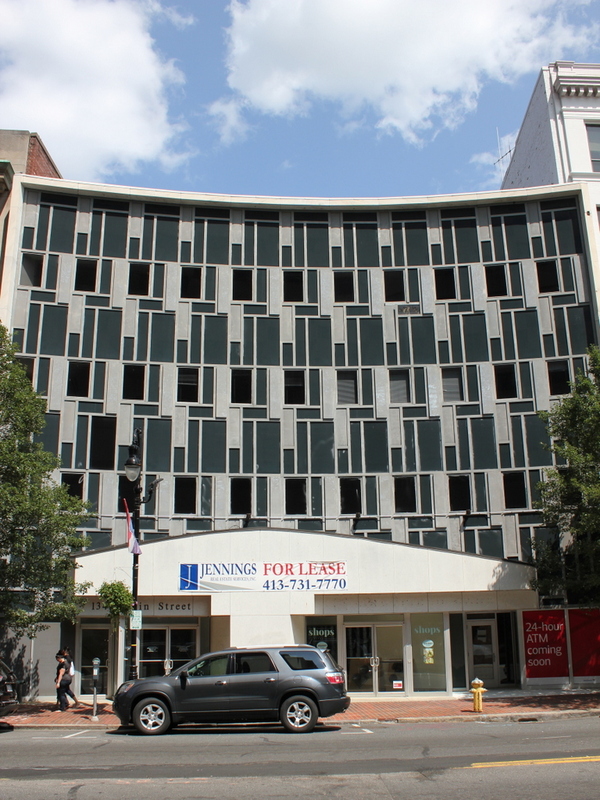 However, the W. L. Martin Block is still standing, without many exterior changes from this angle. In the background, St. Jerome’s Church is also still there, although most of the interior had to be reconstructed after a major fire in 1934. Both the church and the Martin Block are now contributing properties in two different historic districts on the National Register of Historic Places, with the church in the Hampden Park Historic District, and the Martin Block in the North High Street Historic District. 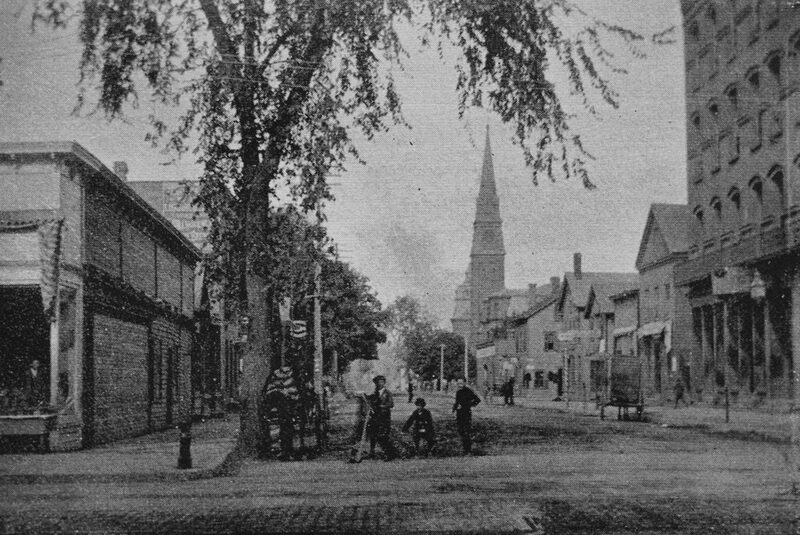 Looking northwest on Hampden Street from the corner of High Street in Holyoke, around 1892. Image from Picturesque Hampden (1892). 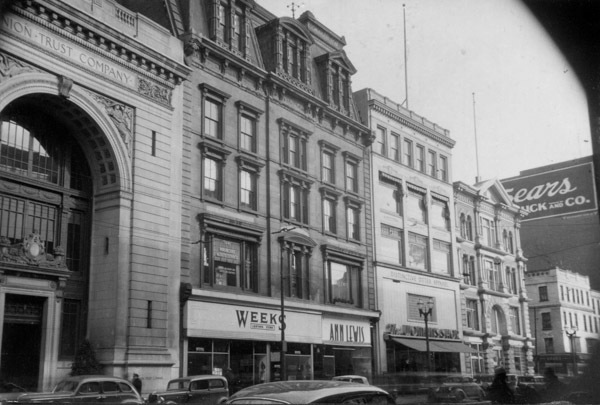 The first photo shows downtown Holyoke during the height of the city’s prosperity. 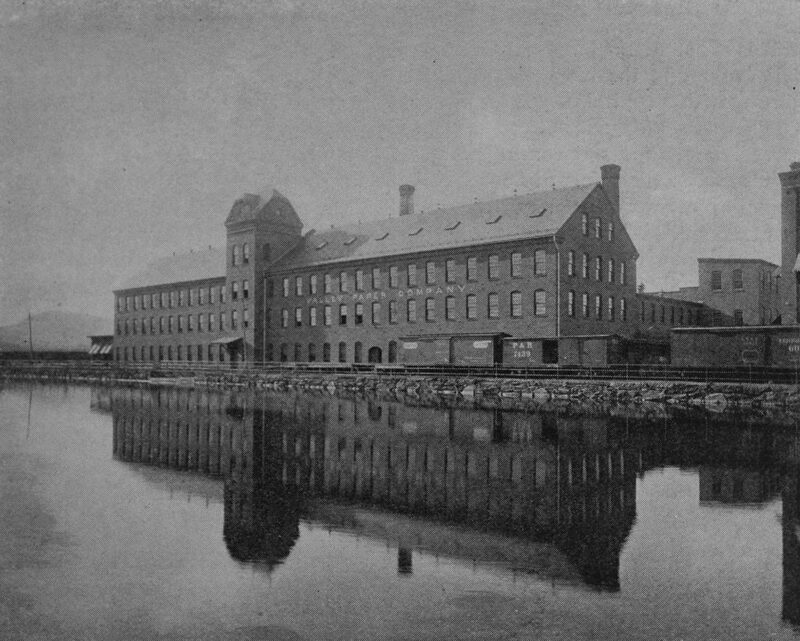 At the time, Holyoke included a number of factories along its extensive canal system, and it was a leading producer of paper and textiles. Further up the hill was High Street, which was the main commercial center of the city. It was part of the city’s street grid – a rarity among New England’s otherwise largely unplanned cities and towns – and was intersected by cross-town streets that led further up the hill to the residential neighborhoods. The names of these streets alternated between those of prominent early industrialists (Lyman, Dwight, Appleton, etc.) and those of Massachusetts counties (Suffolk, Essex, Hampshire, etc.). Hampden Street, shown here in these two photos, was named for Holyoke’s own county, and, perhaps not coincidentally, is the longest of all these county streets, extending all the way up the hill to Easthampton Road. 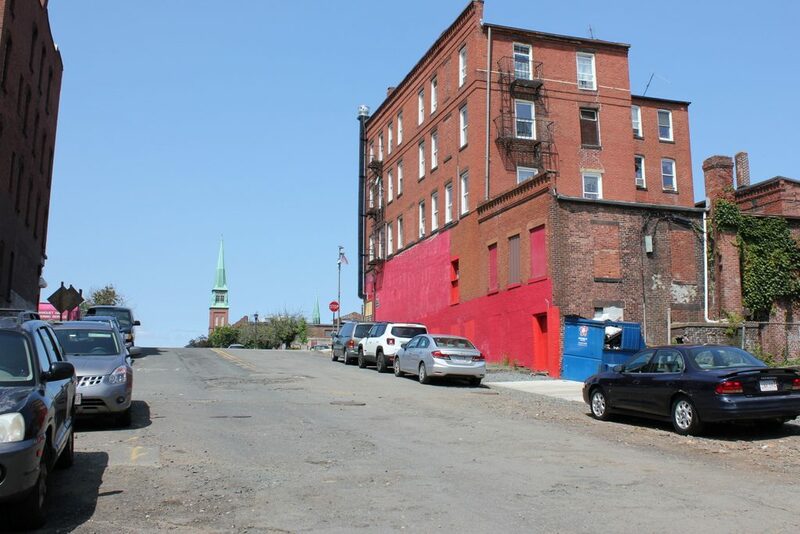 Here in the center of Holyoke, probably the most notable landmark along the street is St. Jerome’s Church, which stands at the corner of Chestnut Street, near the center of both photos. 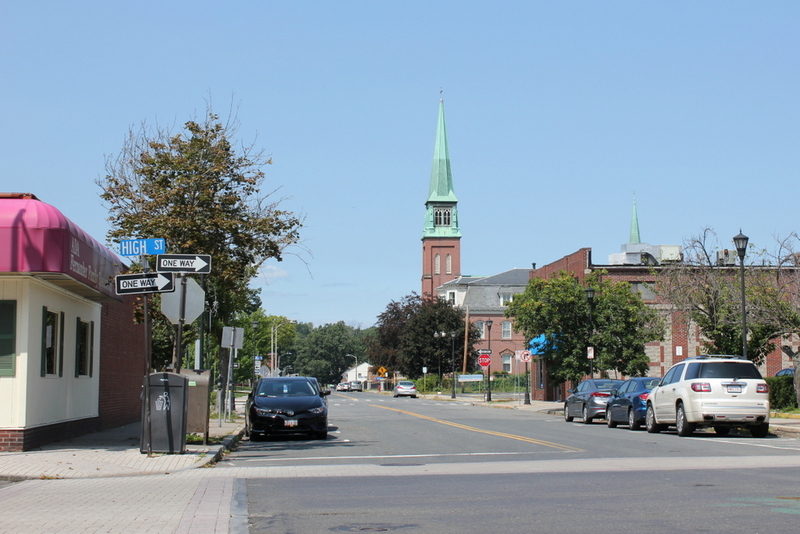 It was built in 1858, in the early years of Holyoke’s development, and it was the first of many Roman Catholic churches that would be built in the city, in order to serve the predominantly Catholic immigrants who worked in the factories. By the time the first photo was taken, the area around the church included a number of other parish buildings, including the Second Empire-style rectory, which is visible in front of the church. 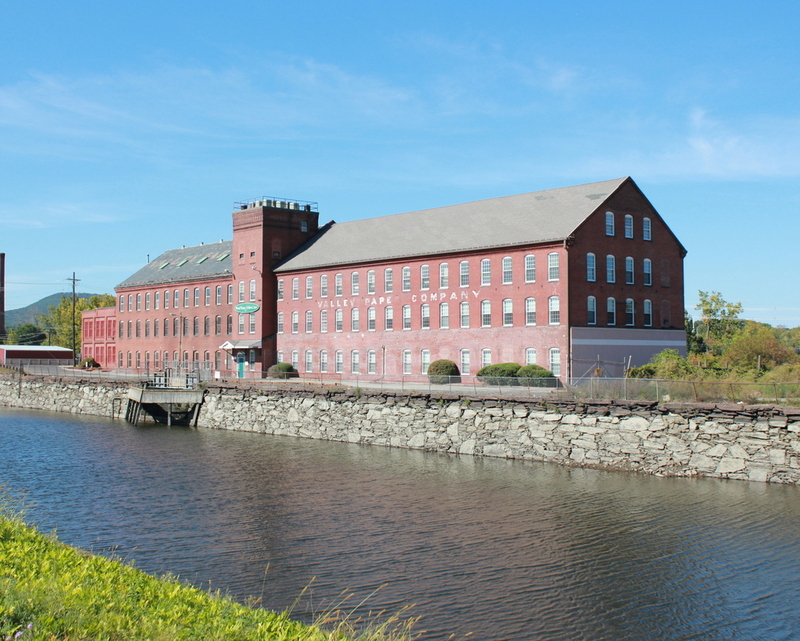 Today, around 125 years after the first photo was taken, Holyoke has undergone some significant changes, most notably the loss of most of its industrial base in the mid-20th century. Much of the downtown area has remained remarkably well-preserved, but this particular scene along Hampden Street is the exception. The brick commercial block on the far right is gone, as are all of the other buildings in the foreground on the right side. On the other side of the street, the one-story building on the far left could plausibly be the same one from the first photo, but if so it has been altered beyond recognition. Otherwise, nothing is still standing from the left side, and the only surviving buildings from the first photo are the church and rectory in the distance.